3. I totally meant what I just said. 4. I am not kidding. 5. You’re a dweeb and a doofus. 6. Don’t you know anything you immature ten-year-old-boy who I can squash like a bug?!? 7. Stop what you’re doing immediately, Mommy, you’re embarrassing me. Which I hear often – when I’m singing aloud, dancing to Justin Timberlake in the comfort and anonymity of my own home and/or excessively hugging Eldest One (EO) in public. So I was expecting to hear “Seriously!” a lot on our exciting night at the Taylor Swift concert. EO’s first concert! Get me a tissue, I’m all verklempt! I certainly wasn’t anticipating a huge bonding experience – we were with lots of other mums and daughters, so I knew EO would rather hang with her friends (you talk about me being embarrassing in public?) rather than sing along with me to “Speak Now”. What I was looking forward to – in a sociological sort of way – was watching EO’s reaction to the power and beauty of the live show. What I like to call, when I take my music way too seriously: the rapture of the collective experience. But today when I asked EO what she thought of Taylor Swift, I got a smile and a “Pretty cool”. Pretty cool? Is that all? Oh, my EO plays it close to the vest. Let’s see: beautiful? Check. Talented? Double-check. Charismatic? Triple Check. And most importantly: Believable? Check that to the nth degree. So when she smiled her aw-shucks smile and told the audience, “I love you Hong Kong,” I expect a good ninety percent of the concertgoers – an only-in-Hong Kong mix of tween girls and twentysomething Chinese boys – actually believed her. And when she sashayed to the edge of the stage and threw a beguiling look left, I thought, heck I haven’t seen this many sideways glances since Susanna Hoffs in the “Walk Like An Egyptian” video. Miss Swift may play the ingénue/outcast in her music videos but on stage and on the 30-foot video screens, she knows how to work it. Ten thousand tweens can't be wrong. 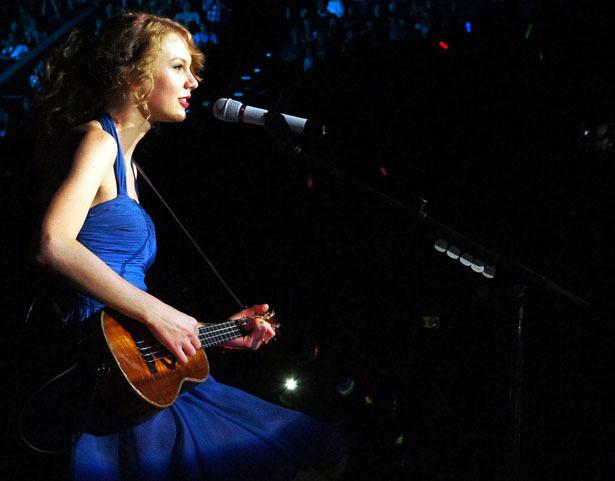 From a photo contest on the official Taylor Swift website. 1. The rise of a new modesty in pop culture. 3. The return of the perm.